As The Guardian's no.1 fashion correspondant and Fashion Editor, Jess Cartner- Morley gives her fashion advice on this season tickiest trend in today's paper. 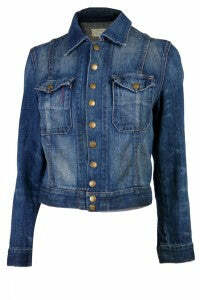 Naturally mentioning Donna Ida and her tip oin the trend- Current/Elliott's snap jacket! 3) Don't go with a very fine chambray shirt with a very heavy denim jean. That's not double denim, that's cheating, and it doesn't have the right impact.